Whilst the Digital PlanetClick twitter audience is still dwarfed by the Digital Planet Listeners’ Facebook group, I’m keen to see if we can try to grow it… one way might be to show who’s recently been tweeting about the programme, and encourage people to start following each other and chatting about the issues raised in the programme a little bit more – something Gareth Mitchell (@garethm) can now pick up on at least on the first airing, as Click now goes out live…. 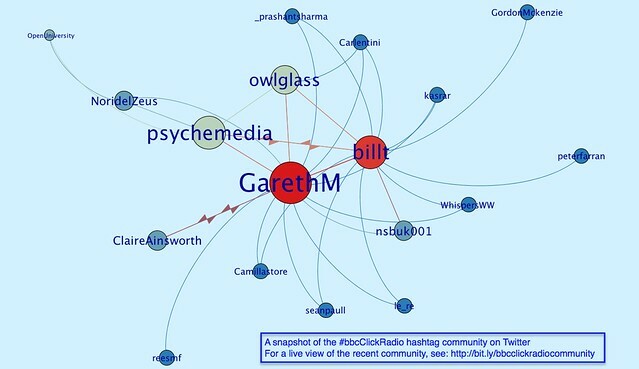 So to that end, I’m going to try to work up a special version of my Twtter friendviz application that shows connections between folk who’ve recently tweeted a particular term, and in this case, the #bbcClickRadio hashtag. To see the map, visit http://bit.ly/bbcclickradiocommunity.